Aside from having the willpower to choose healthier foods over what I consider to be ones that are ‘naughty’ (for me) the hardest part of my eating regimen is finding products that check off all the boxes for me AND taste good. Well, this WAS one of the hardest parts of getting started when I originally jumped into the vegan and candida-cleanse world in the summer of 2017. Talk about overwhelming! But now I feel equipped and in the know on where to find products that taste good and make me feel like a million bucks! My relationship with food is complicated. Like most people, I would assume, I make food choices because of the immediate emotional response versus the health rewards. I also think in great extremes which can be problematic when looking for balance. Together, my emotional eating and inability to find balance led me to being very sick in 2017. And now after having my second baby I am trying to figure out a healthy balance with food again. This involves accepting there are certain foods that don’t sit well with my body (e.g. dairy, gluten, eggs, loads of sugar), and knowing I am fully responsible for keeping myself fueled and happy (and happy doesn’t mean eating five donuts because they taste good in the moment; it means having an apple with almond butter because it tastes almost as good as a donut but without the physical consequences). While I don’t consider my lifestyle to fall into the category of a well-known diet like paleo or keto, and I try to avoid calling what I eat a ‘diet’, I do have a few guidelines that help me when I meal plan, reach for something in the fridge, or hardest of all, go out to eat at a restaurant. They are outlined below in great depth. • I avoid dairy and eggs. Dairy is my biggest trigger and this includes heavy cream, cheese (goat cheese is an exception), milk, sour cream, cream cheese, yogurt, and butter. As such there is a big group of items that are usually off limits. Ice cream, most cheese heavy dishes and snacks, burrata (oh sweet burrata! ), and creamy sauces are no go’s for me. Not only do these items cause me severe cystic acne but they make my stomach feel bloated and icky. On top of my milk sensitivities, I also have an egg allergy that developed after I had Lachlan. While I can stomach small traces of it in things, I haven’t had am omelette or scrambled eggs in more than three years. • I avoid gluten. Especially when it’s things like pizza dough, bagels, breads, pastries, etc. Sometimes I can stomach a little gluten if it’s used as a binding ingredients in things like meatballs for example, or noodles in a soup, but for the most part, gluten makes me feel very uncomfortably full, bloated, and tired. I also find my skin to look much more dull, blotched red, and dry when I eat high traces of gluten. • I order or shop for protein that hasn’t been doctored up or pumped up with additives. Meaning I’ll go for grilled, hormone-free chicken added to my salad instead of chicken wings. Or a high-quality piece of steak instead of a hamburger slathered in melted cheese. Even better, fresh, sustainably sourced seafood like a grilled salmon filet instead of breaded fish. While I used to have a strict vegan only diet, I now try to eat meat in small amounts to help manage my anemia (and thus, my exhaustion). If the meat I consume is good quality I usually feel energized by it so I give myself grace as a former vegan and consider it a-OK in this season. • I make or order foods that have a variety of flavor profiles. This is a key to making sure I feel fulfilled emotionally when I eat versus feeling like I’m getting the short end of the stick. I believe this is why my go to breakfast dish is SUCH a winner! Instead of what could feel like a boring plate of sweet potatoes it feels like a burst of flavors and a variety of foods all into one satisfying meal. How this translates to other meals and ordering when eating out? I look for interesting dressings like infused vinaigrettes, creative presentations of vegetables like mashes, and any inclusions of fresh herbs and in-season produce. I’m also not afraid to ask for ‘sides’ of things that I can simply add to dishes like avocado with breakfast, lime with my salad, or fresh veggies with my bun-less burger. • I mostly say no to sugar. Unfortunately, the sugar I most love is the kind paired with heavy dairy. So cheesecakes, butter-based desserts, whipped cream type goodies, and heavy pastry dishes like brioche French toast. I LOVE these things and swear I should have been born in Paris but alas I am a Canadian born gal stuck in the Midwest with food sensitivities. So I tend to flock to restaurants where there are many dairy-free dessert options. Which thankfully are becoming more common these days! Things like coconut milk ice cream, dairy-free chocolate, and natural sugar ingredients like maple syrup and honey used in place of refined sugars are safe. • I have to fight for balance. In the past there’s been extreme candida-cleanse Rhi. And I liked her because she was skinny and energetic and felt amazing. But that Rhi was obsessive and felt anxious anytime she had to leave the house to eat. Then there’s YOLO Rhi and she’s loves eating five pieces of Pizza Hut pizza because #thatcrust, a whole box of Oreos, and a bottle of Mexican coke all in one sitting because it just tastes SO good. But that Rhi was useless to everyone because she was sick, literally sick, tired, lifeless, and miserable because of way those things physically and emotionally manifested themselves. So now I fight for balance and being honest with myself about what that looks like every time I put something into my mouth. So if you’re like me and you just can’t stomach certain indulgences but you like to eat because it’s a party for your tastebuds and emotions, I want to give you some tried and true suggestions of where you can start with specialty food items. Below is a list of staples, things I depend on to eat and be happy, that I would highly recommend. Tinkyada pasta: The first time I ate a bite of Tinkyada’s brown rice pasta I nearly cried! Unlike a lot of the gluten-free or chick-pea based pastas out there (which I have tried many), this tastes almost as close as the real deal. Not only does Tinkyada hold up texture like traditional pasta but the flavor profile is pretty neutral, and a full serving doesn’t leave you feeling heavy and bloated. I eat a big bowl of the spaghetti with vegan butter and parm as a once in a blue moon treat but the shape variety makes for delicious stir fries and casseroles. Nutcase vegan sausages: This vegan meat was one of the things I was allowed to incorporate into my diet a month into my candida cleanse in 2017. And it was a game charger for me because it felt like I had flavor back in my diet! I have a texture issue with real sausage and find it to be one of the harder meats to digest, but with this nut and nutritional yeast based alternative it’s like I get the best of both worlds. We prefer this in our home to animal based sausage and use it often in breakfast dishes or with pasta. Note: this is the priciest product on the entire list here so it’s often a special treat when we make it out to the health food store. Trader Joe’s vegan chorizo: I was hesitant to jump on the Trader Joe’s train when they finally came to Grand Rapids in the fall of 2015 because I felt like everyone shopped there just to say they shopped there. But I must say they have a pretty awesome selection of products, and ones that cater to people like me, who have special eating restrictions. When Andrew brought home their vegan chorizo I was hooked. It’s a staple in our house. And it’s one of TJ’s top 10 products every year, which is easy to see why once you take a bite! Violife vegan parmesan cheese: Like I mentioned above, giving up cheese was hard. There’s nothing quite like an expensive piece of cheese. Or grated parm on noodles, salads, appetizers, and the list goes on. As I mentioned above, when I switched from regular pasta noodles to brown rice noodles, it was almost like the real deal except I greatly missed grated parm on top. Enter this vegan parm substitute! You really cannot tell the difference and it even grates to a similar parmesan cheese texture. I put it on my breakfast dish, pasta dishes, and even bruschetta. Harvest Snaps: There are a lot different companies that make similar snack crisps but these are the ones we most frequently buy. This is my go-to when I’m craving something crunchy or salty. I have a hard time not eating an entire bag of these delicious little crunchies that’s how good they are! While there are a handful of flavor options like Creamy Ceasar which my husband loves, I stick to the Lightly Salted as they seem to be the cleanest option. The Perfect Bar: While these aren’t officially vegan, Perfect Bars are a nice ‘treat’ alternative to a chocolate bar (which is something I could easily reach for after every meal if it were in our house). They are also categorized as a protein bar so on the days where I don’t eat meat it keeps me feeling full. There are more than 10 different flavors, and all the bars are gluten free and made with superfood sources that you won’t find in a KitKat. Enjoy Life Foods: The primary Enjoy Life Foods product we buy is their line of dairy-free chocolate chips. We use them in everything from homemade protein bites to delicious desserts from Oh She Glows. Or as a simple pick-me-up by the handful (guilty). I also recently tried their sunflower butter cups, as an alternative to peanut butter cups, and while they aren’t quite like a Reese’s it’s nice to see they are satisfying. 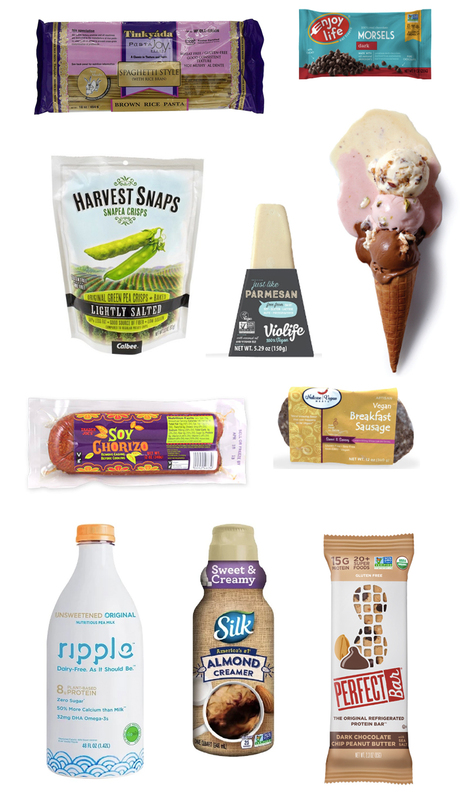 Aside from the variety of chocolate chip options, Enjoy Life has an impressive array of products which we hope to explore in the future. Love’s ice cream: This Grand Rapids based company makes arguably the best ice cream you’ll ever taste and how lucky for us they are local! They make dairy ice cream but most of their flavors come in vegan versions and they are hands down the very best. Everything tastes exactly how like how I would guess nature intended it like their vegan strawberry ice cream; it’s SO fresh and smooth and mildly sweet unlike sugar-loaded traditional ice creams. I noticed they are now carried in Meijer so who knows, they may expand outside of the Mitten soon! Ripple Milk: The milk alternatives these days are vast and delicious. Remember when soy milk was this radical option outside of cow’s milk? Now the milk alternative section at any health food store, let alone big name grocers, will amaze and delight (macadamia nut milk anyone?). Ripple is made with pea protein and comes in unsweetened, unsweetened vanilla, and chocolate for a nice variety. Ripple is especially great as a kid-friendly option if your little can’t or you prefer them not to consume cow’s milk. We’ve found Ripple to hold up the best in sauces, baking where milk is required, and in smoothies. It’s perfect if you don’t love the nutty flavors of nut milks. Silk almond milk creamer: This is probably the ‘junkiest’ item on the list in terms of faux sugars. But one of my goals in 2019 (so far a bug success too) was to eliminate pricey Starbucks visits and make coffee at home. Not only does this obviously save money but it allows me to leave the home less, make use of the Nespresso machine we have, and best of all enjoy our mornings better as a family over hot cups of frothy coffee. This creamer has helped make my decaf coffee taste really delicious and something I look forward to each morning! What are your favorite specialty foods? Are there any ones you’re dying to tell the world about?